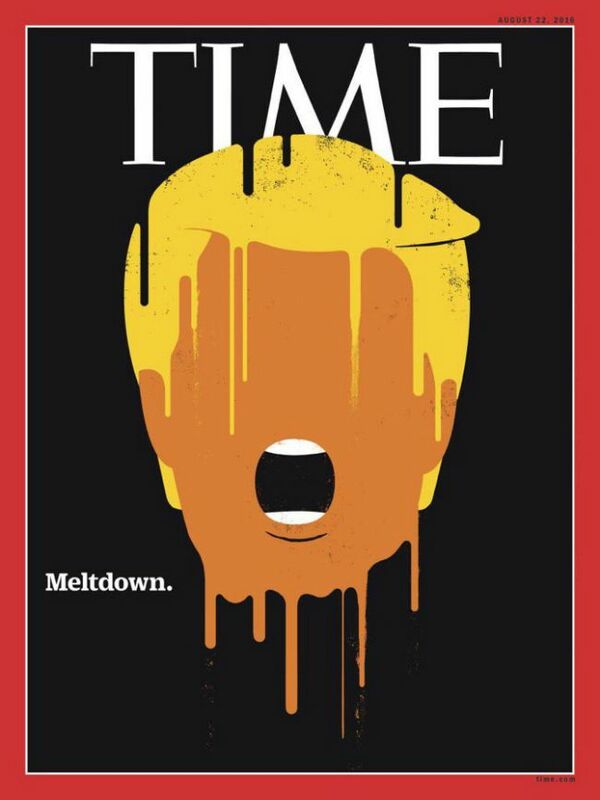 New York - Donald Trump is facing a full meltdown on the cover of the August 22 edition of Time magazine. The cover image renders the Republican presidential nominee’s weeks-long slump in the polls following the Democratic National Convention and a slew of controversies ignited by Trump’s own comments at rallies and in response to interview questions. Trump’s visage is a frequent image on the cover of the longtime weekly news magazine, though this week’s cover depicts the nominee in a slightly less positive light than his notable cover appearance last year. I didn't know this 10-page printed rag is still around! The desperate left-wing crazy media is desperate. They are the ones who will suffer meltdown when Trump gets elected. Trump is going to say nobody reads it anyway as he does after any article he doesn't like. It's an interesting prediction, but it's baseless. Time is grasping at straws. Oh my! The first exact portrayal of him! He has more meltdowns per day than the Hillary campaign can ever beg for. As a registrd Republican Im also melting down with him. No candidate to vote for. He keeps on digging his grave day by day deeper& deeper. Sounds like theres no hope left for him. Hes absolutly callous, calling for violence & a shame to America. We can sit out this election cause theres no lesser of the two devils to vote for. Some republicans told me even if clinton wins trump will still be president. Another liberal dishonest media source in the tank for lying Hillary...nothing new here. Hmm,maybe that's why Time didn't put Hillary's State Dept./Clinton Foundation pay to play scandal on it's cover. Isn't that a MUCH bigger story? “ The desperate left-wing crazy media is desperate. This is not desperate, this called "doing a good job". They depicted Trump exactly the way he should be. His vulgarisms against WOMEN will be the last straw. Nearly or over 90% of GOP women voted for Bush 1, Bush 2, McCain, Romney. The Fuhrer will get only 30% of them, according to all polls. Shame on him! WOW another liberal media outlet in the Clinton's pocket. That is a great graphic. It is a fine bit of art. For some reason, it makes Trump too young, and yet it is instantly recognizable. That cover is beautiful. It makes me cry tears of joy and wonder. That rotten liberal trump is going down. America will dump him like the trash he is.